Register for the 1st NanoMed North Focus Seminar. Hem » NEWS » NEWS » Register for the 1st NanoMed North Focus Seminar. Please register before Thursday April 24. You find the form at the bottom of the page. 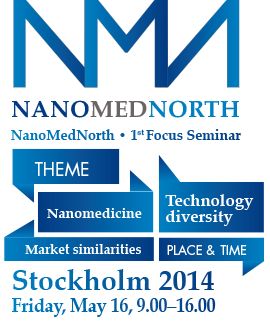 NanoMed North members and potential members are most welcome. Free of charge membership can be obtained during the meeting! NanoMed North members are welcome to present their areas of research and/or business (achievements-challenges-future). You are kindly encouraged to apply for a 15 minutes speaker-slot when registering. We will have room for around 10 presentations. European Technology Platform Nanomedicine (ETPN) will introduce the meeting. The symposium is free of charge, including coffee, lunch etc. Cancellation after April 30 will be charged a “no-show”-fee of 500 SEK. Will be sent out at least two weeks in prior to the meeting. 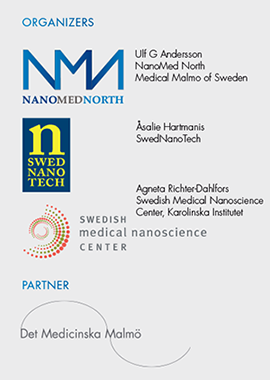 The day before, Thursday May 15, SwedNanoTech is arranging their annual Nanoforum at the same venue. Please visit www.swednanotech.com. An excellent opportunity for a perfect 2-day nano-combo experience in beautiful Stockholm. Welcome to an exciting meeting!